Vineland Flint Glass Works, Vineland, New Jersey created the Durand Art Glass Division in 1924, which resulted in the production of Durand Art Glass, rivaling Tiffany, Steuben, and Fenton's freehand art glass. 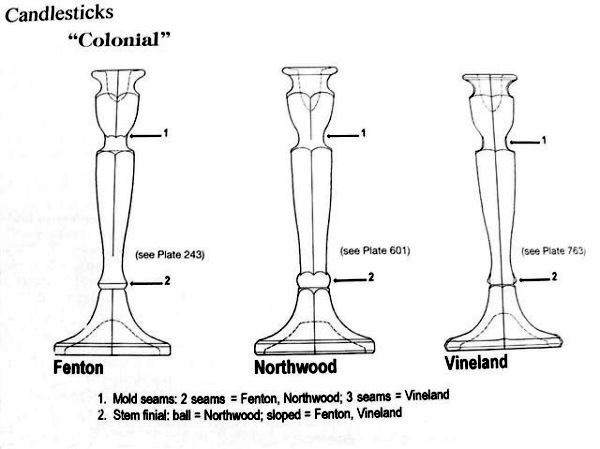 Though little information has been found concerning the Vineland Flint Glass Works' general tablewares, several stretch glass pieces have been found with the Vineland paper label still attached. From these labels, three actual colors and several numbers which refer to mold and shape have surfaced. Their glass quality and colors were quite variable. 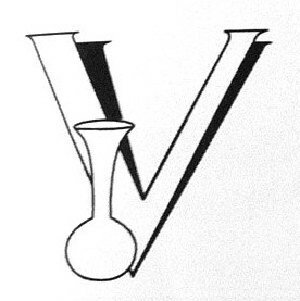 Mark for Vineland Flint Glass Works. Comparison Study of the three types of FLORENTINE or COLONIAL Styles. Plate #764. 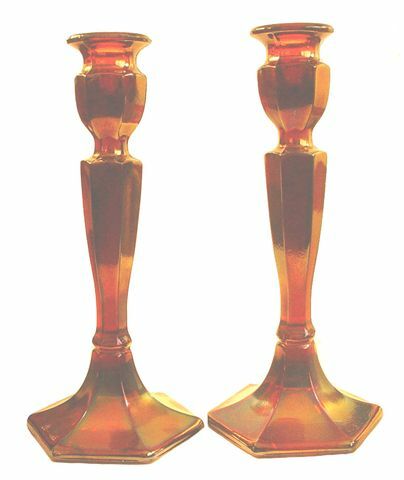 COLONIAL is accredited to the Old Gold, Amber Candlesticks by Vineland. 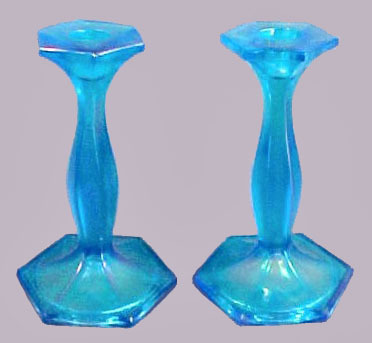 They are 10” tall with a base of 4 ¼”. 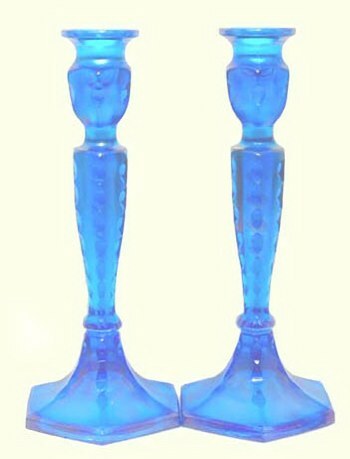 The glass is significantly thicker/heavier than that of either Fenton or Northwood examples in the same basic pattern. 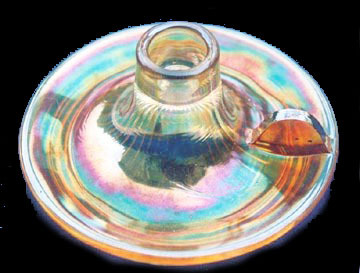 History of the Vineland Flint Glass Works appears in: American Iridescent Stretch Glass by John Madeley & Dave Shetlar, Copyright 1998. FLORENTINE: Fenton - Ice Green and White, along with Red are quite difficult examples to locate. This pattern is found in 8 ½” and 10” heights. Amber, amethyst, celeste, celeste/gold trim, Grecian gold, russet/olive, and wisteria are additional colors known in this design. CUT OVALS: Fenton - is basically the Florentine pattern with cut-away ovals. They are found in 8”-10 ½” sizes, with celeste, Grecian gold, marigold, red and vaseline as the color spectrum. Seldom available. #249-Fenton: Celeste, green, Grecian gold, ice green, marigold, red, red/gold trim, white and wisteria comprise the color range in this pattern. Fenton #649 in Celeste and Black. Courtesy Dave Drabing. Fenton #649 10 in. 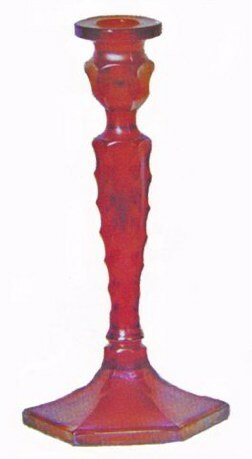 2-Tone Candlestick -Grecian Gold-Black. 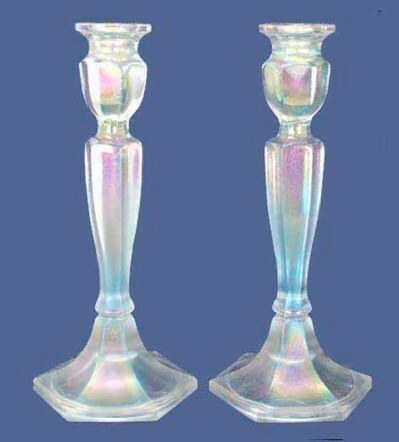 #649-Fenton: These candlesticks are seen in Fenton Glass - The First Twenty-Five Years. They are 10” tall, circa 1923.
in Lavender by Duncan Miller-9 in. tall x 5 in. base. 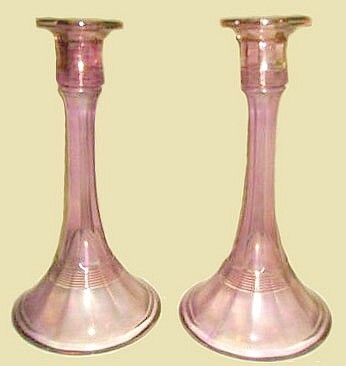 FLUTE and RINGS: Six rings surround the base of the candle cups, and the base of these candlesticks produced by Duncan-Miller. 5 in. diam., stands 3 in. tall. 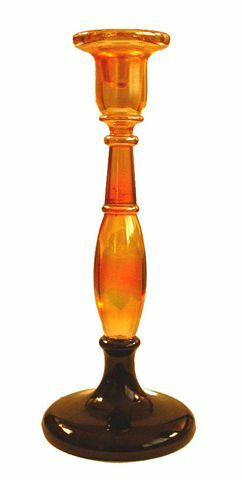 Very likely an example of 1920s production, this shiny marigold candlestick is not on record in any of our resources. We would appreciate hearing from any of our viewers who may have access to such helpful information. Finally, all of you be of one mind, having compassion for one another; love as brothers, be tenderhearted, be courteous; not returning evil for evil or reviling for reviling, but on the contrary blessing, knowing that you were called to this, that you may inherit a blessing. For “He who would love life and see good days, let him refrain his tongue from evil, and his lips from speaking deceit. Let him turn away from evil and do good; let him seek peace and pursue it. For the eyes of the Lord are on the righteous, and His ears are open to their prayers; but the face of the Lord is against those who do evil.” And who is he who will harm you if you become followers of what is good? But even if you should suffer for righteousness' sake, you are blessed. “And do not be afraid of their threats, nor be troubled.” But sanctify the Lord God in your hearts, and always be ready to give a defense to everyone who asks you a reason for the hope that is in you, with meekness and fear; having a god conscience, that when they defame you as evildoers, those who revile your good conduct in Christ may be ashamed. For it is better, if it is the will of God, to suffer for doing good than for doing evil.